– Changed Northbound/Southbound button to be the reverse station action, instead of double clicking station box. – Train schedule details can also be viewed by sliding times to the left. – Localized app, supports Simplified Chinese and Spanish. - Improved GPS functionality to wait for more data before processing. - Highlight trains in schedule that have a twitter alert. 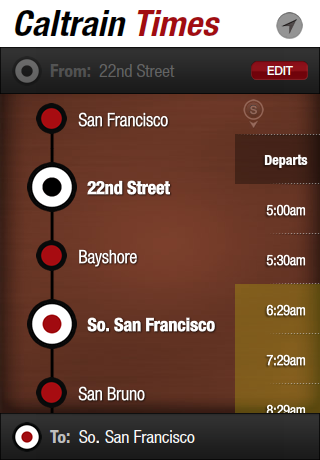 Interactive train schedule for the Caltrain system in California, USA. Easy one page navigation allows you to select the “From” and “To” stations, allowing to quickly see train times. Selecting just the “From” station provides quick view of next northbound and southbound train times. - Find nearest station with GPS integration. - Get alerts from @caltrain and @bikecar twitter accounts for trains included in your selection. - Full schedule details with fare amounts. - Supports showing times for routes that require a transfer. - Select between weekend and weekday, app knows which day it is by default. - Reverse selected stations by clicking North/South icon. - Shows changes to train times for Holidays. I have made the source code for this application under a Creative Commons – Attribution-NonCommercial-ShareAlike 3.0 United States license.